Applications are invited for the Registration of Construction Contractors for Civil and Electrical work to be undertaken during the year 2017. Application shall be sent by Registered post addressed to Deputy Registrar, Capital Works and Planning, South Eastern University of Sri Lanka, Oluvil to reach him on or before 30.10.2016. Late applications will be rejected. The words "Registration of Construction Contractors" should be marked on top left hand corner of envelope. Contractors presently registered as Main Construction Contractors under the Scheme of National Registration and Grading of Construction Contractors developed by the Institute for Construction Training and Development (ICTAD) for M8 / C9 and above will be eligible to apply for the registration. There is no specific form of application for the above registration. However, prospective contractors are requested to submit their applications by giving all the relevant details along with photocopies of the relevant documents. A Cheque for Rs. 2,500.00 drawn in favour of Bursar, South Eastern University of Sri Lanka, as registration fee, should be sent along with the application. 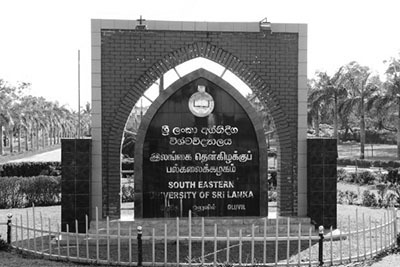 Any particulars related to this registration can be obtained from the Deputy Registrar / Capital Works & Planning of the South Eastern University of Sri Lanka, Oluvil on working days during office hours.